The American Chemical Society organizes two meetings each year, bringing together chemists from all across the world to discuss the latest and greatest results in a broad range of fields. To impose some order on the throng of about 15,000 participants (! ), the meetings are split into divisions and subdivisions. 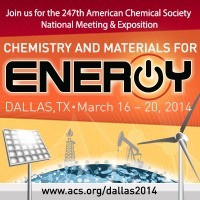 The Division of Physical Chemistry recently added a subdivision on astrochemistry, leading to our very own symposium inside the 2014 Spring Meeting of the ACS in Dallas, Texas. We kicked off, rather ridiculously, at 8:30am on Sunday morning. My own talk on episodic accretion was Sunday at 11:20am, by which point everyone was at least awake, though perhaps not yet entirely at peace with losing a precious weekend day. The astrochemistry schedule continued for the rest of the day, all of Monday and Wednesday, and Thursday morning, plus a poster session Wednesday evening. Tuesday was reserved for a set of plenary awards talks for the entire Division of Physical Chemistry. Just this last weekend, I joined the Ann Arbor Science & Skeptics group for one of their monthly meetings to talk about chemistry in space and the origin of life on Earth. An audio recording of the full event is available as a podcast. “We studied the chemistry of the gas and dust cloud surrounding the early protostar (an early stage of star formation). In this dense cloud, a chemical reaction takes place that enables the formation of several kinds of complex molecules, including methanol. One would expect that all of the molecules would be near the star, but with one of them we saw a clear ring structure. Something had removed a certain molecule, HCO+, from a wide area around the protostar,” explains astrophysicist Jes Jørgensen, Associate Professor at the Niels Bohr Institute and the Centre for Star and Planet Formation at the University of Copenhagen, Denmark. Check the NBI website for the full story. If you prefer Dutch, Astronomie.nl has a shorter version. Here is part four of the travel diary about my trip to the James Clerk Maxwell Telescope on the Big Island of Hawaii. Eight hours of sleep at a more oxygenated altitude erased last night’s headache. I enjoy my final meal at HP – a giant stack of meatballs with curly fries – and drive back down to the JAC offices in Hilo. This is my first visit to Hawaii, so I’m tacking on two days of sightseeing before flying home. First, though, I’ll spend one night in Hilo to catch up on lost sleep. Uncle Billy gives me the same room as last time at his Hilo Bay Hotel. Following a suggestion from Wikitravel.org, I head out for dinner at Cafe Pesto on Kamehameha Avenue, described as “a reasonably nice restaurant with a view of the bay [and] a wide range of food, everything from pizzas to furikake-crusted ono.” The restaurant is packed, but there’s still room at the bar. I order a pizza Luau (“Kalua pork, local sweet onions and fresh Hawaiian pineapple”) and a passion-mango margarita. The kitchen is right in front of me, and while waiting for the pizza to arrive, there’s plenty of entertainment in watching the cooks (all male) and waitresses (all female) prepare and serve the food. The promised view of the bay exists only beyond a small parking lot and a fairly wide boulevard. On the other hand, Wikitravel.org was spot-on about the food: my margarita and my pizza are “reasonably nice”: inoffensive, catering to a wide audience, but lacking in real flavor. The pizza crust is particularly bland. Here is part three of the travel diary about my trip to the James Clerk Maxwell Telescope on the Big Island of Hawaii. “The only constant is change,” said Heraclitus of Ephesus around 500 BC. This holds true for everything in astronomy, although it can take an extremely long time before certain changes become apparent. The Sun hasn’t changed much in the past 4.5 billion years, and likely won’t change much for another 4.5. One day, though, it will blow up and turn into a red giant. Very young stars, of the type that I’m observing this week, change on timescales of about a million years – a blink of an eye for the universe, but an eternity by human standards. It doesn’t matter if I observe my baby stars today or tomorrow, or next week, or next year, because they don’t change that rapidly. Other objects in space can be much more variable. A particularly violent example is a gamma-ray burst. Typically lasting less than a minute, a gamma-ray burst carries more energy than the Sun will emit over its entire lifetime. The burst itself is followed by an afterglow at longer wavelengths that can last for hours or days. Gamma-ray bursts are of interest for their unique properties – it’s hard to find more powerful explosions anywhere in the universe – but their short lifetimes make them difficult to observe. You never know when one might go off, and if one does, all telescopes around the world are likely busy doing something else already. This is why most telescopes have a policy that allows current observations to be put on hold in favor of short-lived targets like gamma-ray bursts.